I forgot to take a picture of this. I will add it next time. This recipe came from our Weight Watchers Weekly (and is where I got the picture until I take my own). 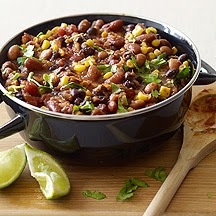 My first thought when I saw this recipe was that I have everything in my pantry to make this except fresh cilantro and lime - and it did not need to be added till the end. I was heading to the store later that morning, so I put in on too cook. Anything I can make with the staples in my pantry is always a good thing. This recipe did not require much change. I did use my homemade taco seasoning mix. It is great and I know what is in it. This recipe got a great review from 3 out of 4 of us. Daniel said it was good, but did not have meat in it. I can easily see adding meat to this sometimes. It would change the points value, but if you use the right meat - it remains 0 for simply filling. This recipe serves 10. I made two frozen dinners out of it and the rest was consumed yesterday. We had warm full bellies on this freezing, windy, rainy Saturday. This will now be in our winter rotation. The lime and cilantro give it a fabulous flavor. I also added a little grated cheese on top. Be sure to add points for cheese. Daniel said it made great Frito Pie. Be sure to add points for Fritos. Combine onion, garlic, beans, tomatoes, tomato sauce, and taco seasoning in a slow cooker. Cover and cook on high for 2-3 hours (or low heat 4-6 hours). Add frozen corn during last hour of cooking. Stir in lime juice and cilantro just before serving.